Certifications are not only a great way to prove you have knowledge, skills and competencies in a particular subject area, but also can improve your earning potential. In fact, a recent study done by the Institute of Internal Auditors (IIA) showed certified internal auditors salaries are up to 40 percent higher than auditors without certification. In the growing area of GRC, individuals often wonder what certifications are available for governance, risk management and compliance professionals. 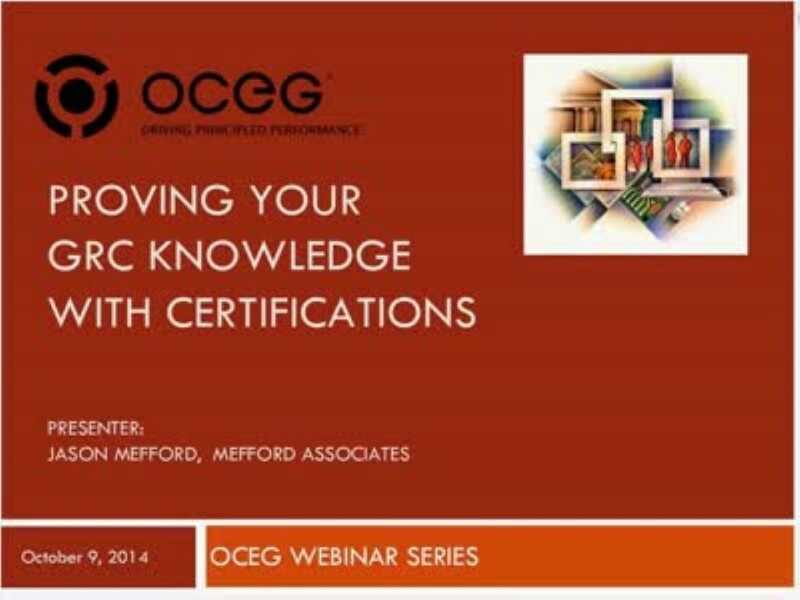 This webinar discusses the available certifications, backed by OCEG, that are the industry standard for GRC certifications. This is a must attend session for anyone considering or interested in certification. Understand the requirements for getting certified as a GRC Professional and GRC Audit. We have emailed instructions to access Proving Your GRC Knowledge with Certifications to . Make sure the email arrives in your inbox: either add "support@oceg.org" as a safe sender to your email platform, or if you use Gmail, drag our email into your Primary tab.